First, I want to thank all of the contributors to this book: Ari Alexander, Emily Arnold-Fernández, Professor Amy Chua, Mauro De Lorenzo, Dr. Cheryl Dorsey, Bill Drayton, Dai Ellis, Conor French, Seth Green, Scott Grinsell, Dr. Barbara Harrell-Bond, Jamie Hodari, Andrew Klaber, Rachel Levitan, Leah Maloney, Matt Mitro, Gul Rukh Rahman, Sophie Raseman, Dr. Oliver Rothschild, Ben Stone, and Anthea Zervos. Conceiving of, assembling, co-authoring, and editing this book has provided me with a special opportunity to work with each of these amazing individuals. Through this joint effort, my enormous admiration for them and their work has grown even greater, and it has been a tremendous honor to work together. Thank you to Shannon Howard, Fernande Raine, and Sally Stephenson of Ashoka for facilitating Mr. Drayton’s Foreword and to Armand Biroonak, Shalena Broadnax, and Jesse Gerstin of Echoing Green for facilitating Dr. Dorsey’s Afterword. More gratitude than I could ever express is also due to Adrienne Bernhard, my talented Editorial Assistant and lovely cousin. She thoroughly edited multiple drafts of the manuscript and improved it significantly, in substance, structure, and style. Thank you, as well, to Christina Beasley, James Montana, and Alex Treuber for precise, plentiful, and punctual research assistance. 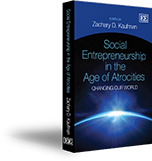 In addition to all of those mentioned above, several other people have also served as particularly influential sounding boards as I have developed my ideas on social entrepreneurship and pursued this book project. Roshan Paul, Ilaina Rabbat, Paul Rodolfo Rodríguez, David Sullivan, Philip Ugelow, and David Wishnick have continuously offered critical insight on social entrepreneurship. Fahim Ahmed, Fawzi Jumean, Ilya Podolyako, and Yong Suh have always provided excellent input on management, business, and strategy. Dr. David Backer, Dr. Samuel Charap, Christopher L. Griffin, Jr., Scott Grinsell, Richard James ‘Jim’ Mitre, Dr. Vipin Narang, and Katherine Southwick have consistently offered wonderful feedback on law, politics, and international relations. Dr. Phil Clark and Mauro De Lorenzo have been valuable and cherished colleagues through years of studying, discussing, working on, and traveling through Africa, particularly Rwanda. Several other friends and colleagues have been especially helpful, including Ligia Abreu Medina, Carolyn Crandall, Dr. Brendon Graeber, Arvind Grover, Elizabeth Katz, Tisana ‘O’ Kunjara Na Ayudhya, Dianne Liu, Brendan & Lacey Lupetin, Sarah Martin, Jackson Muneza Mvunganyi, Tanusri Prasanna, Eve Semins, Dr. Michelle Semins, Vance Serchuk, Dr. Tamara ‘Tammy’ Vanderwal, Lauren Vestewig, Dr. Sunil Wadhwa, and Dr. Jared Williamson. Since I was a child, librarians have been my teachers and friends, and libraries have been my sanctuaries and playgrounds. Librarians at Yale University generously contributed their research skills, expert advice, and encouragement. Thank you to the following individuals from Yale Law School’s Lillian Goldman Law Library: Femi Cadmus, former Associate Librarian for Administration (current Director, Cornell Law Library); Margaret Chisholm, Reference Librarian; Ryan Harrington, Reference Librarian for Foreign & International Law; S. Blair Kauffman, Law Librarian & Professor of Law; Evelyn Ma, Reference Librarian; Teresa Miguel, former Associate Librarian for Foreign & International Law (current Associate Librarian for Administration); John B. Nann, Associate Librarian for Reference & Instructional Services; and Camilla M. Tubbs, Head of Research Instruction. And thank you to the following individuals from Yale University Library: Ann Okerson, former Associate University Librarian for Collections & International Programs, and Dorothy Woodson, Curator, African Collection. Thank you to Peter Schuck, the Simeon E. Baldwin Professor Emeritus of Law at the Yale Law School, and Dr. Judith Goldstein, Executive Director of Humanity in Action, for their mentorship. Their generosity of guidance and kindness knows no bounds, and they have been inspiring and encouraging forces in this book and everything else in my life for more than a decade. My loving family is wonderfully supportive, and I am deeply grateful. Thank you to my father, Dr. Howard H. Kaufman; my mother, Romaine H.M. Kaufman; my brother, Ezekiel ‘Zeke’ A. Kaufman; my sister-in-law, Chan Joo ‘C.J.’ Park; my niece, Stella Anne Kaufman; my nephew, Julian Alexander Kaufman; my grandfather, Rabbi Dr. Shalom Coleman; my uncle, Martin ‘Marty’ Coleman; my aunt, Heidi Zajd; and my cousin, Alexandra ‘Lexie’ Amy Coleman. Thank you, as well, to my late grandmother, Stella Lande Kaufman, a generous philanthropist and news junky, who taught me early on about public service and politics, and the promise and pitfalls of their intersections. I am indebted to several institutions for their support as this book grew from an idea to a reality. I thank the University of Oxford, Stanford University, and Yale Law School, where I spent several years developing these ideas and which were flexible in allowing me to pursue this project while I was primarily focused on my graduate and law school work. Thank you to the College of William & Mary, Columbia University’s School of International & Public Affairs, Dartmouth College, Dartmouth’s Tuck School of Business, George Washington University’s Elliott School of International Affairs, Georgetown University, New York University School of Law, Stanford University, the University of Connecticut Law School, the University of Oxford, Yale University, and Yale Law School; Rotary clubs and conventions in Rwanda, Spain, and the U.K.; the International Youth Assembly of the YMCA-YWCA in Umeä, Sweden; the Institute for International Mediation and Conflict Resolution in The Hague, The Netherlands; and Unite For Sight’s annual Global Health & Innovation Conferences (particularly the fourth one, on April 15, 2007, at Stanford University Medical School; the fifth one, on April 12, 2008, at Yale University; and the sixth one, on April 18, 2009, also at Yale University) for inviting me to give lectures that grew into this book. Thank you to Yale Law School for providing funding to support my work on the manuscript, and to its former Associate Dean, Mark Templeton, for facilitating that grant. I also thank Google Inc. and The Honorable Juan R. Torruella of the United States Court of Appeals for the First Circuit, for granting me time while I worked in their offices to continue laboring on this book. Thank you to my former colleagues from the United States Department of Justice – particularly Carl Alexander, Faye Ehrenstamm, William ‘Bill’ Lantz, James ‘Jim’ Silverwood, and Pierre St. Hilaire – who sent me on my very first trip to Rwanda, where I initially became inspired to study and work in the field of social entrepreneurship. It was during that first visit to Rwanda that I became involved in the effort to build the Kigali Public Library (see Chapter 4), and it is my past and present colleagues in that endeavour – including Karin Alexander, Lauren Baer, Caroline Batambuze, Beth Bensman, Page Brannon, Urmi de Baghel, Michelle Drucker, Jill Fenton, Neil Fenton, Rose Gahire, Benjamin Heineike, Amanda Hektor, Neil Helfand, Jonathan Home, Sarah Ingabire, Diana Kakoma, Sarah Kakoma, Sam Kebongo, William ‘Bill’ Kosar, Vivek Krishnamurthy, Janet Labuda, Gwenn Laviolette, Beth Haines Levitt, Dr. Martin ‘Marty’ Levitt, Abbie Liel, Binu Malajil, Paul Masterjerb, Dr. Jolly Mazimhaka, Jennifer McCard, Edson Mpyisi, Gerald Mpyisi, Ambassador Zephyr Mutanguha, Grace Nkubana, Andrew Park, Beth Payne, Michael Rakower, Raj Rajendran, Dr. Geoffrey Rugege, Sheba Rugege-Hakiza, Duhirwe Rushemeza, Liliane Rushemeza, Joan Rwanyonga, Jelena Šljivić Mishina, Janepher Turatsinze, Dudu Thabede, Violette Uwamutara, Priya Vallabhbhai, Viresh Vallabhbhai, Claudia Veritas, Gitau Wamukui, and Nils Zirimwabagabo – to whom I am most grateful for inspiring me to reflect upon and share the lessons we have learned. Last but certainly not least, I am indebted to Edward Elgar Publishing’s Executive Editor, Alan Sturmer; Assistant Editor, Alexandra Mandzak; Desk Editor, David Fairclough; Copyeditor, Rebecca Wise; and their anonymous expert reviewers for their encouragement, insights, and feedback in refining this book. Any errors are, of course, my own.